Marie Wilson stars as Irma Peterson, the definitive dumb blonde. 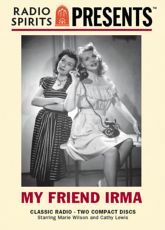 Irma shares her zany misadventures - and a New York apartment - with her more sensible roommate Jane Stacy, played by Joan Banks. In spite of her intellectual imperfections, Irma possesses a friendly, na�ve sweetness that inspires true loyalty. Jane, who she often drives to distraction, is her fiercest protector. And, Irma's boyfriend Al (John Brown) actually considered getting a job once in order to win her heart. Often knocking at the apartment door is the girls' saucy upstairs neighbor, Professor Kropotkin (Hans Conried) - frequently followed by their feisty Irish landlady Mrs. O'Reilly (Gloria Gordon).